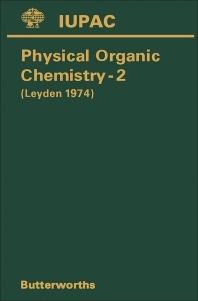 Physical Organic Chemistry—II provides information pertinent to the fundamental aspects of physical organic chemistry. This book discusses the common phenomenon in ionic organic chemistry. Organized into seven chapters, this book begins with an overview of electrochemical methods to obtain thermodynamic information on unstable species. This text then presents a brief summary of the experimental method in low temperature photochemical studies. Other chapters consider the general approach to understanding the molecular basis of enzyme catalysis and regulation. This book discusses as well the reactivity model for concerted cycloaddition reactions, which allows a systematization of substituent effects. The final chapter deals with the relative stabilities of phosphoranes in terms of the relative apicophilicities of groups, ring strain and steric factors, and experiments. This book is a valuable resource for organic and inorganic chemists. Postdoctoral students and scientists who are interested in physical organic chemistry will also find this book extremely useful.